Los Angeles is perhaps the nation’s capital of "wannabe" artists, filled with aspiring actors, directors and screenwriters who are waiting tables, parking cars and brewing coffee. All have hopes of someday escaping the drudgery of these day jobs for the golden opportunity when their art might become their full-time work. But a few teens in Los Angeles have been earning their first pay as working artists: studying Shakespeare and writing their own poetry and music, all while earning minimum wage. It's a Tuesday afternoon during rush hour in downtown L.A., and 14-year-old Rogelio is reciting poetry on the sidewalk. "Walkouts, protests, marching, charging onto a war, onto a war we can't win," he says. "Where even the bravest of men sometimes lose." From where he stands, you can see hints of the gleaming Disney Concert Hall up the street. Rogelio continues, "A war against poverty, hunger, ignorance." But we're on the fringes of downtown, scattered with rundown, industrial-looking buildings, outside the home of Shakespeare Festival/LA. "I'm stuck in the hood." But Rogelio isn't performing Shakespeare. These are his own words. 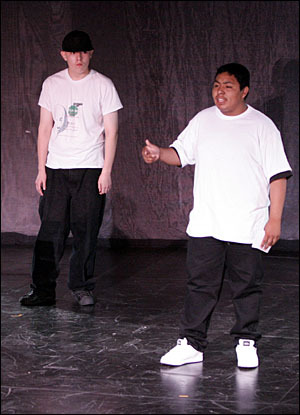 His writing mentor, Adrian Guzman, likes the mood that this sidewalk brings to Rogelio's performance. "Since his piece is really about people living in the city," says Guzman, "it helps to bring his piece to life." Rogelio keeps performing, "Take a stand for freedom, a stand for brown pride, a stand for your family. But most important, a stand for yourself." Rogelio's big for fourteen - football-player big - with a wide brown face and a fast smile that he often shoots to the floor when he talks. "I never really wrote poetry. Like, who writes poetry?" asks Rogelio. "Now I write it all the time. When I'm done with my homework, if I've got an idea, I write it down." 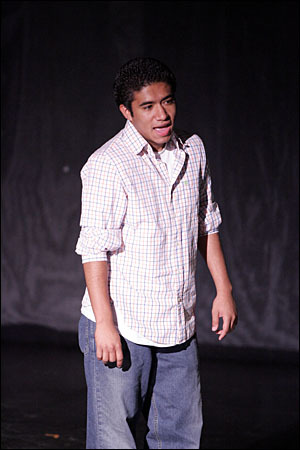 Rogelio is part of a job-training project at Shakespeare Festival/LA with youth ranging in age from 14 to 18. The job description: study Shakespeare sonnets and soliloquies, and then write your own poetry or music to eventually appear on a CD. Almost 50 teens interviewed, and 35 were hired. Youth come here through a variety of sources. Some are court-referred, some are sent through high school English teachers. Some are simply curious and follow their friends. But they're all typically labeled "at risk." "They have to dodge gang members. They are in families who are struggling to get by," says Chris Anthony, director of education. "They are in incredibly overcrowded schools which mean that they get very little individual attention. And you know, the opposite of war is art. When you have all that stuff going on, it sometimes pumps up the need to create something so that you can say 'This is mine. I did this. This is me. I am a vital, productive, ingenious person. Not only do I take lemons and make lemonade, I take lemons and make poetry.' And that's cool." They've now released a CD of their work titled "Urban Shakespeare." Studying Shakespeare was the starting point, but the final product is all theirs. On a day awaiting perfection. while blood rushes through my veins. "Honestly," says Anthony, "everything comes out of the content that they discovered in Shakespeare. This is how Shakespeare lives and breathes in their lives. All his themes about love and trust and fidelity, friendship, they're all in there." Like being crazy looking for you. An indescribable feeling known to be unknown. Before entering this program, most of these teens had only the briefest introduction to Shakespeare in their high school English classes. Here, a teacher asks the class, "Do you know an example of a Shakespeare soliloquy?" A student answers, "When Hamlet says 'To be or not to be?'" "You know, Shakespeare's tough," says Anthony. "Shakespeare is work. Shakespeare is demanding. Once you crack that code, you know you can crack a code. Young people take that back to their classrooms, and they aren't so afraid. They aren't so willing to give up on something. "There is a woeful level of support for arts in education. Woe, woe, woeful level of support," says Ben Donnenberg who started this program. It emerged out of the L.A. riots in the early 90s as part of a collaboration between the National Council of Christians and Jews -- and Shakespeare Festival/LA. 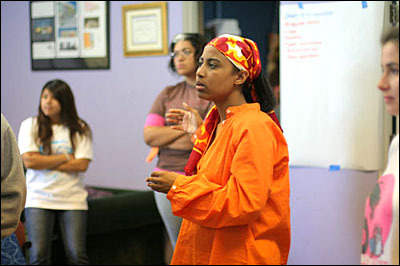 The two groups were looking to address the needs of at-risk youth. So Donnenberg went into neighborhoods in East and South Los Angeles to basically ask young people one question: what did they want? "They told us they us what they wanted were jobs, and they wanted teachers who really cared about them and what the teachers were teaching," says Donnenberg. He thought he could recruit the right kind of teachers. So he initially developed a program where youth could adapt Shakespeare plays in their own words. But he didn't intend this to be training for future actors or set designers. The experience would have lessons that would apply to any job in the real world. "They're learning how to show up for work on time, they're learning how to be respectful of other people, they're learning how to punch a time card, they're learning how to fill out a job application, they're learning how to interview for a job," says Donnenberg. Plus, they're getting paid minimum wage: $6.75 an hour. They report for work three times a week where, in addition to studying Shakespeare, they learn the basics of composing and writing their own pieces. Writing coach Judy Oden gives the students an assignment: "You have the next three minutes to write down everything you ever heard about love. Everything somebody told you, you saw on TV, you saw in the movies." She wants a process that would support more than the typical teenage writings about love. "Love hurts. OK, when does love hurt? Tell me about a time that love hurts." Full of hatred, love and despair. You're happy, I'm happy. This is insane. "It takes so much guts to get up there and to tell your story and to tell your story and tell people how you really feel about something," says Oden. In recent years, this novel approach to job training through the arts has attracted interest around the country. First Lady Laura Bush brought them to the White House for one of her top education awards. Celebrities like Tom Hanks and Rita Wilson stage an annual fundraiser. They're now a model program for gang-prevention projects starting in Miami, Richmond, and Milwaukee. Their signature "send off" at Shakespeare Festival/LA is always a public performance before family and friends. Tonight there's a crowd of about 200 assembled to hear music and poetry from their CD, "Urban Shakespeare." More than a dozen people are there just to hear Rogelio recite his two-minute poem. "We have a lot of pride in him - make sure that his dreams come true," says one friend. Rogelio begins his poem "Walk Out." But what happens when these three months are over? Education director Chris Anthony says some of these youth will stay in touch for years, but most will not. Yet that doesn't diminish her certainty about the impact that they've had. "Not many people can do what these guys have been doing," says Anthony. "Nobody is ever going to be able to take away the fact that they're on a CD. And so, if I see anything, I see an added confidence. It's easier to deal with the whips and scorns of time once you have that kind of confidence." 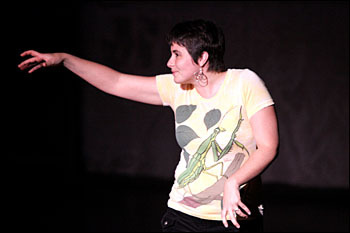 For more information on Shakespeare Festival LA, visit their Web site: http://www.shakespearefestivalla.org. You can also preview and purchase the audio CD Urban Shakespeare. Major funding for American RadioWorks comes from the Corporation for Public Broadcasting. 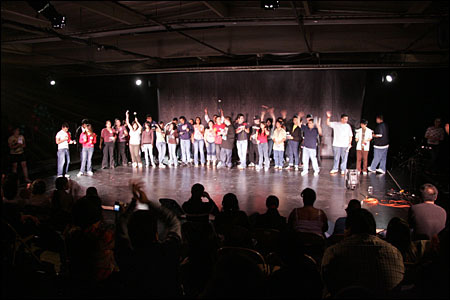 Additional funding for Urban Shakespeare is provided by the William T. Grant Foundation.